NEW ZEALAND — When a professional footballer signs for a club in Asia or in the US, especially if he once plied his trade in Europe, his move is often seen as a fall from grace. Usually it is a last resort since no other club is interested in signing him or a financial move aimed at securing the player financial future as he reaches the twilight of his playing days. The likes of Thierry Henry, David Beckham, Angel and Robbie Keane have all moved on to the United States after being offered big pay checks in the booming Major League Soccer (MLS). World Cup-winning captain Fabio Cannavaro also secured a lucrative deal to play for Al-Ahli in the UAE League. Even Barcelona coach and former Spain midfielder Josep Guardiola gave a cameo at Mexican club Dorados after his European playing days were over. After being released from his contract with CD Ronda in the Spanish third division, Guirado was linked with a number of clubs in high-profile countries such as Japan, United Arab Emirates and China among others. 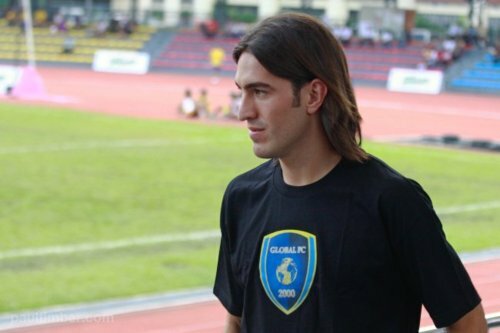 Such was the reason why Guirado’s move to Global came as a surprise to football fanatics. “Yes I heard that a number of clubs were looking at me but the timing was off.” Guirado explains. But surely a back-up role to a UAE club or a J-League club would suit everyday footballers better than a starting role in a Philippine semi-pro outfit? Guirado explains his decision. Guirado isn’t the only one in his family who is a professional football player. He has an elder brother Juan Luis, a defender, has played for third division clubs in Spain. Asked if we were to see a Spanish version of the Greatwich tandem of Chris and Simon, Angel relates that he is clueless about his brother’s plans but is aware efforts have been made to contact him. He also shares how his brother is happy for him and for the team. The influx of foreign-bred football talents into the team is one that has merited both positive and negative reactions from Filipinos. When asked what his opinion was on foreign-based athletes, Guirado has this to say to us. Angel also notes that it is good to have a local league such as the UFL in the country.